100th anniversary The entire campus community will commemorate 100 years of coeducation at William & Mary during the 2018-2019 school year. Today’s Convocation ceremony will mark the official kickoff of a yearlong celebration of the 100th anniversary of coeducation at William & Mary. In the fall of 1918, 24 women were admitted as undergraduate students, making William & Mary the first public coeducational university in Virginia. Today, William & Mary women include professors, deans, coaches, award-winning scientists, playwrights, poets, entrepreneurs, community leaders and more. Over the course of the academic year, the university will host a series of special events, including the first-ever W&M Women’s Weekend for alumnae, Sept. 21-23. “The year will unearth, explore and illuminate the stories and accomplishments of many of the more than 55,000 alumnae and the many W&M women students, faculty and staff,” said Jayne Barnard, 100th Anniversary Committee co-chair and James Cutler Professor of Law, emerita. The school year will offer hundreds of opportunities for students, faculty, staff and community members to participate. To keep people informed, the 100th Anniversary Committee has launched a website, a Facebook page and an events calendar. The 100th Anniversary Committee has transformed the main floor of the Sadler Center with inspiring banners, photos and artwork representing 100 years of women students at the university. The display includes an interactive feature that leverages the historical significance of ribbons, commonly used as symbols of a cause. Some of the first women students at W&M wore ribbons to support each other. Visitors are invited to add the name of a W&M woman who has affected their lives to a ribbon, then weave it into the display. On the second floor of Sadler, the President’s Collection of Art has installed an exhibition of art created by alumnae when they were students. 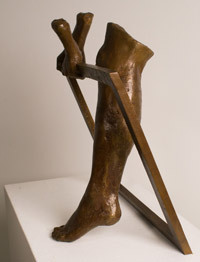 The exhibition, Following in Their Footsteps, also features a bronze sculpture, “Dawn,” created by alumnus Christina Fleckenstein ’18 and commissioned by the Triangle Arts & Culture League for the 100th anniversary. Both exhibitions will remain in the Sadler Center until May 12. The Virginia Symphony Orchestra will debut its “Symphony Under the Stars” series at 7 p.m. on Aug. 30 in a free performance at The Martha Wren Briggs Amphitheatre. The orchestra will perform music by female composers and about strong women, such as “Rey’s Theme” from Star Wars. Wristband distribution begins at 5:30 p.m., and doors open at 6 p.m.
An exhibition of art created by Department of Art & Art History alumnae will open in Andrews Hall on Sept. 6 and will be complemented with a speaker series featuring Birdie Boone ’95, Jessica Singerman ’02 and Jane Lillian Vance ’80 and on Sept. 20, and Katie Honbarrier ’10 and Linda Moses ’16 on Oct. 20. The exhibition will remain on display in Andrews Hall until Oct. 20. Tamura Lomax, cofounder of The Feminist Wire, will present “Chasing Tenure: Lessons from an Independent Black Woman Scholar” at 6 p.m. on Sept. 11 in the Sadler Center in an event that is open to the public. Lomax earned a Ph.D. in religion from Vanderbilt University, where she specialized in black religion and black diaspora studies, and developed expertise in women, gender & sexuality studies and black British and U.S. black cultural studies. She is co-author of Womanist and Black Feminist Responses to Tyler Perry’s Cultural Productions and author of the forthcoming Jezebel Unhinged: Loosing the Black Female Body in Religion and Popular Culture. 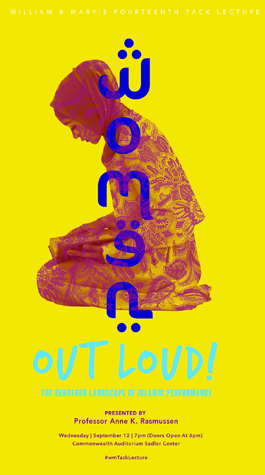 Anne Rasmussen, W&M professor of music and ethnomusicology and the Bickers Professor of Middle Eastern studies, will present “Women Out-Loud: The Gendered Landscape of Islamic Performance” as the Tack Faculty Lecture at 7 p.m. on Sept. 12, in the Commonwealth Auditorium. The event is free and open to the public, though reservations are requested. In the talk, Rasmussen will strip away the many misconceptions Westerners hold about music, women and the Muslim world. Aïcha Redouane, an internationally recognized Moroccan diva, and percussionist Habib Yammine will present traditional and original works based on Sufi poetry at 7:30 p.m. on Oct. 28 in Ewell Hall. Having revitalized the Arab music school of Nahda, Redouane and Yammine have dedicated their art to interculturalism and spiritual/musical dialogues for peace. All concerts are $5, or free with a William & Mary I.D. The annual Patrick Hayes Writers Series is also participating in the 100th anniversary, with writer Lorrie Moore appearing at 7 p.m. on Sept. 26 in Tucker Hall. Moore is a noted writer of novels, short stories, children’s books and essays and was elected to the American Academy of Arts & Letters in 2006. She has taught in writing programs at Princeton, Wisconsin, Cornell, Michigan, NYU and Vanderbilt. Her latest book, an anthology of essays, is See What Can Be Done. The series continues at 5 p.m. on Oct. 11 in Tucker Hall, when Professor Elizabeth Spires reads. Spires’ work has appeared in the New Yorker, Poetry, American Poetry Review, New Criterion, Paris Review and more. She is a recipient of the Amy Lowell Poetry Travelling Scholarship, a Whiting Award, a Guggenheim Fellowship and two fellowships from the National Endowment for the Arts. She teaches at Goucher College. Both appearances are free and open to the public. Carla Hayden, the first woman and first African-American Librarian of Congress, will appear in a free public talk at 4:30 p.m. on Sept. 28 in the Commonwealth Auditorium. Hayden is also the first professional librarian in 60 years to hold the post. Hayden received an honorary degree from William & Mary in 2017, noting her leadership of the National Library Association, the Chicago Public Library and the Baltimore library system. Hayden received a B.A. from Roosevelt University and an M.A. and Ph.D. from the Graduate Library School of the University of Chicago. W&M Libraries is sponsoring the event. Seating is first-come, first-served, but reservations are requested. Theatre, Speech & Dance at William & Mary will present “The Children’s Hour” by Lillian Hellman, Oct. 4 through Oct. 7, at the Kimball Theatre. The controversial drama centers on Karen Wright and Martha Dobie, two young women who of spent years working toward running a successful school for young ladies. But when one of their more troublesome students runs away, she creates a lie so shocking, it can only be whispered. The ensuing scandal throws lives into turmoil and threatens to destroy everything they hold dear. Advised for audiences 13 years and older. Tickets go on sale Sept. 4.